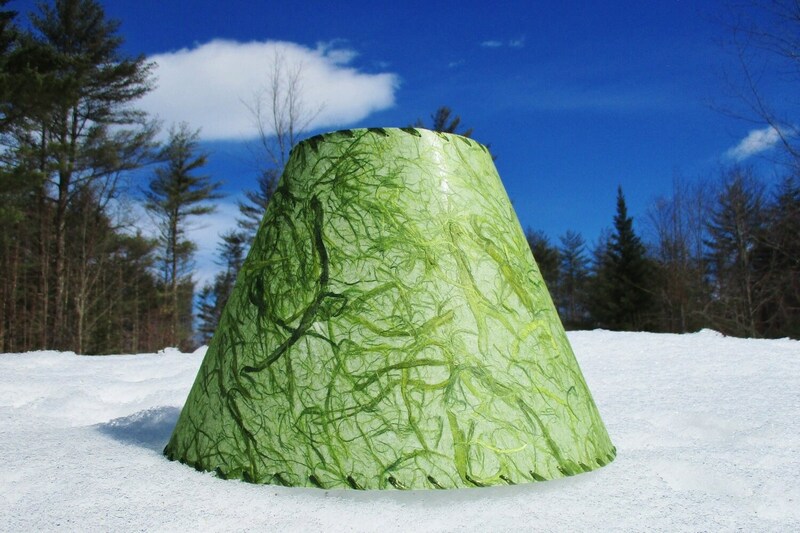 Bold, chunky, swirly green fibers make this lampshade a standout in your home. The shade in the photo measures 7" across the top, 15" across the bottom, and 11" tall. It has a washer top and is stitched with shiny olive green raffia. This shade is in stock and ready to mail. Made from tree free kozo paper, your lamp will have two different looks; when lit, the swirly thick fibers really jump out in color and strong contrast. Please view all photos to see this shade lit and unlit. The paper is laminated to a styrene backing and then stitched on to the hardware. It should be kept out of direct sunlight and dusted regularly to keep its best appearance. 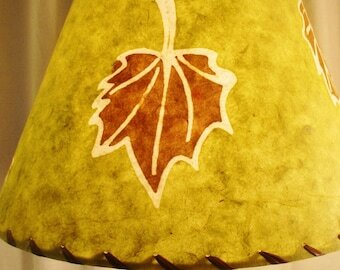 This shade can be made for you in a different custom size - please message me to see if this is possible. All lampshade sales final so please be sure this size and hardware will work for your lamp.